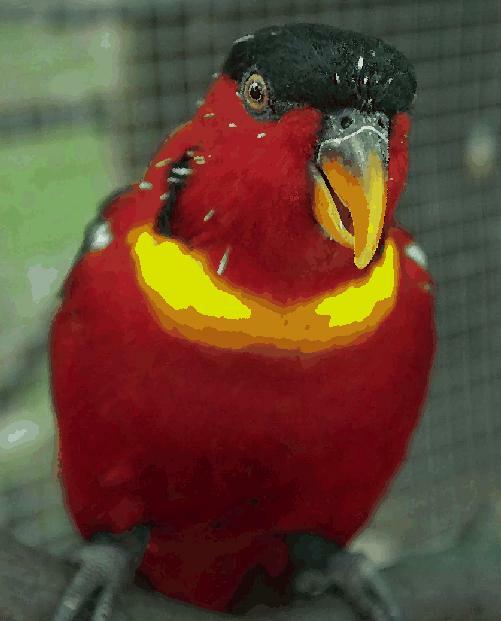 The Lory Picture Gallery is a collection of Lory and Lorikeet bird images. These are from the aviaries of Heather Russell and David Dix, located in Auckland, New Zealand, and taken from late 1999 to the present. We hope to also include images and articles from other lory owners in Auckland, and New Zealand in the near future. We also plan is to have some general information about each type of lorikeet and often links to other sites with further information. This info will be appearing but preference has been to get images up and available first. Full size images are downloaded by clicking on a thumbnail of the image. These can be several hundred Kbytes in size and may take several minutes to download after you click on a thumbnail. On the right is Nippy, she is a three year old Yellow-bibbed lory with a very tempermental nature, that stare is a warning to the camera lens that it is about to get a sharp stab attack. Just before the lunge she makes a loud 'tinkle' sound and the camera holding fingers made a split-second escape. Despite this nature Nippy is an absolutely lovable character. Please let us know what you think of this web site and any suggestions you may have. Thanks for looking and Enjoy! Last modified: 1 May 2002.